Air travel is always an entertaining experience for me. It isn’t always the pleasant kind of entertaining (having an engine blow out on the runway is entertaining in a grim sort of way) but there will always be things, people, and places that cross my path and arrest my attention, no matter where I’m coming from or going to. Sometimes they make me laugh. Sometimes they make me cringe. Sometimes they make me pause and reflect about the meaning of life, the universe, and everything. But mostly they make me laugh. Take flight attendants. They come in all shapes and sizes and personalities. I’ve seen them happy, fat, stern, skinny, bored, angry, sagacious, and suspicious. I have even seen one who thought he was a stand-up comedian – and he was pretty darn funny. But one thing I will never understand is how these people do their job with a straight face. Think about it. These are grown adults who’s primary business is making sure other grown adults are strapped in and not playing with blinky gadgets during takeoff. They make sure we don’t form lines outside the bathrooms. They even pass out toddler snacks to ward off the tantrums (at least, I assume that’s what the juice and peanuts are for). And how about that pre-flight routine? You know, the one where the flight attendants make a series of intimidating hand gestures as they explain “the safety features” of the aircraft. This part always convinces me I’d be better off walking to my destination. For starters, they point us to that marvel of modern technological wizardry – the seatbelt. If, for whatever reason, the plane decides to stop working midair, I can derive great comfort from the fruit rollup-sized strap around my waist. Hallelujah. I’m plummeting to my death, but at least I won’t fall out of my seat on the way down. And the life-vests. Boy oh boy, the life vests. I get why we have them, but when we’re flying through New Mexico and into Nevada, with nary a drop of water in sight, I can’t help but think it’s all a tad overrated. Me: But… we’re flying over a desert. Flight Attendant: That is irrelevant. Me: What do we do in the event of a sand landing? Flight Attendant: **** you. Security! Throw this terrorist off the plane! Surely you encountered his position while reading Orthodoxy, if not in other places. I would not presume to take every word of his as gospel of course, but if I were Calvinist I would be hesitant to recommend him without a disclaimer, especially considering the influence and effectiveness of his writing. Admittedly I’m somewhat confused by your advocacy of Chesterton (although I obviously encourage it in general). It’s a good question, and I’ll do my best to answer it as briefly and thoroughly as possible. I suspect there are others who read this blog who may be wondering the same thing. I am indeed aware of Chesterton’s antagonistic attitude toward Calvinism. In Orthodoxy, for example, he asserts that it was Calvinism which drove William Cowper to madness. In Eugenics and Other Evils, he calls Calvinism “immoral” and “the most non-Christian of Christian systems.” How then, as a staunch lover of the historic Reformed faith, can I feel comfortable recommending such works without a booming disclaimer? It’s very simple, really: as a critic of Calvinism, the Prince of Paradox is a bit of a clown. Remember the scene in V for Vendetta, where Evey awakes to find the hero fencing with an empty suit of armor? It is all very winsome and dramatic, but of course, it is to battle what O’Doul’s is beer: a complete and utter joke. A similar thing happens whenever Chesterton takes a swipe at Calvinism: he blusters a lot and tips his nose in the air and generally makes it clear that he doesn’t approve. And then he moves on. He never seriously engages with it mano-a-mano. Perhaps there is an essay somewhere in which he actually plants his foot and does bloody battle to the death over the matter, but in all my reading thus far, I haven’t encountered any such thing. Yeah. Hard to take seriously, in other words. 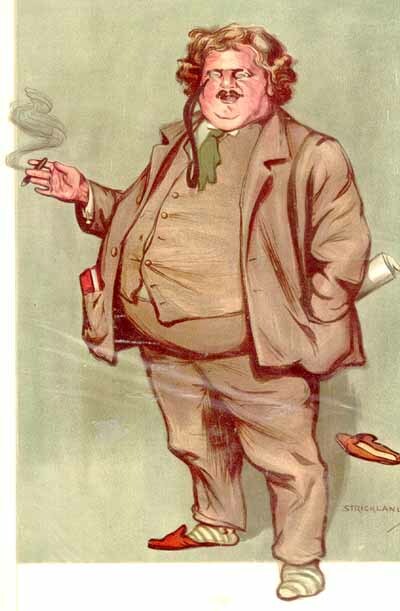 Chesterton’s potshots are so risibly ill-aimed that I am more amused than challenged (let alone concerned) by them. I think it fair to say that Calvinists who know why they are Calvinists will not be knocked out of their position by a bit of rhetorical skylarking.